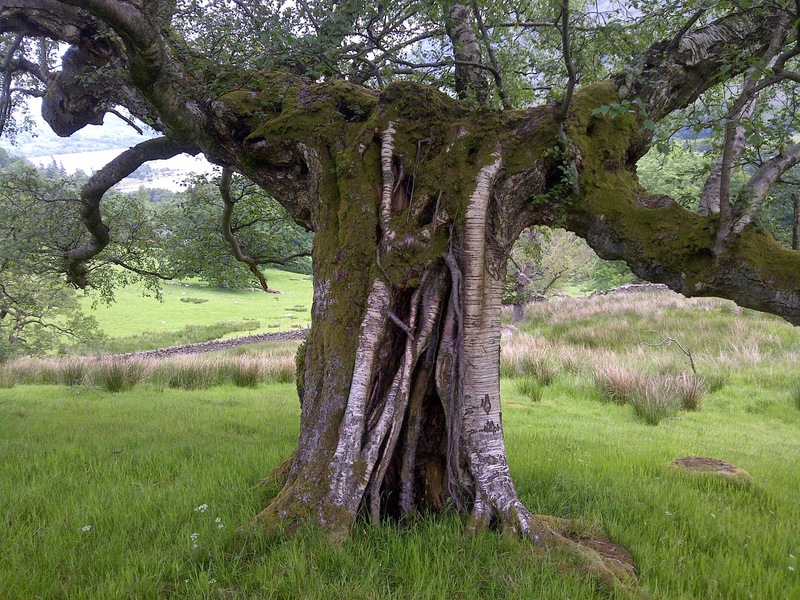 Glenamara Park occupies a small north facing valley in Ullswater and covers an area of about 70 Ha.The National Trust acquired it in 2002 because of its ecological and historic importance with its scattered veteran trees and impressive dead wood habitat. The area was used as a deer park in the 16th and 17th centuries indicated by the substantial high wall around almost the entire perimeter. Other significant interests are a pre historic scoop settlement and the numerous charcoal pitsteads around the site. Here you can just make out the park boundary wall running up the left hand side and coming round under the crags on the right. 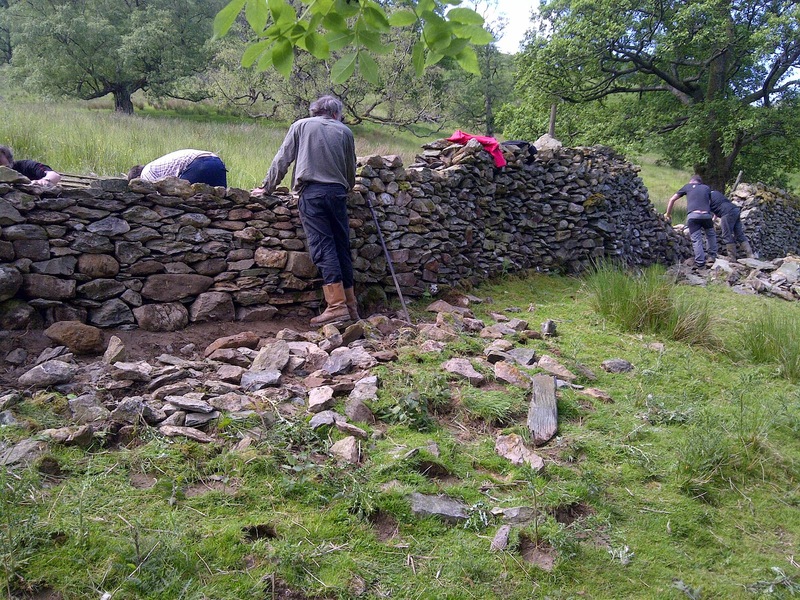 Due to the steepness of the slopes and the exposure of the site the wall often comes down and requires putting back up again. 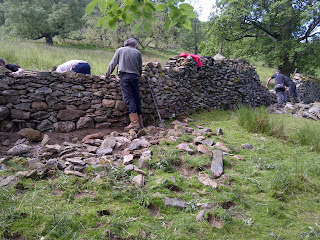 The ranger team putting up two big wall gaps. With the long history of grazing within the park, firstly by deer and then by sheep the trees that remain in the park are becoming very old. These old trees is one of the reasons why the park is so special, veteran trees are very important for wildlife due to the amount of dead wood and cavities which are ideal for nesting birds and roosting bats. 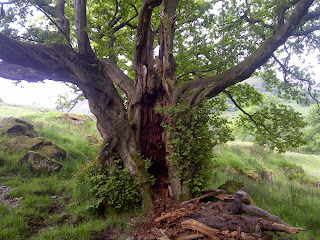 This is an ancient Alder tree which is completely hollow. This is a large Silver Birch with an unusual shape, it must have been storm damaged at some point. Due to the grazing pressures over the years there were no young trees coming up to replace the veteran trees so we had to think of a way to try and get some tree regeneration going and it was decided to remove sheep from the site and replace them with 12 hardy cattle. 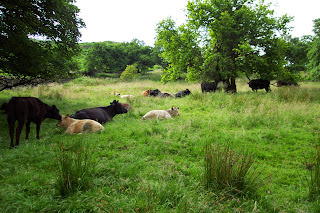 Natural tree regeneration rather than planting was preferred because you retain the local tree provenance and by putting cattle on the site these would trample down the bracken and brake up the ground to allow some tree regeneration. It has been 10 years since we put the cow in and I'm happy to say the trees are regenerating well and in a few hundred years time we will have our next generation of veterans trees. Finally, this is the view from Glenamara Park, you can understand why the early settlers wanted to live here. Woodlands are places of myths, legands and ghost stories, and the evidence of one such tale can still be seen today on modern day maps. In the reign of King Edward VI there was Hugh Hird, the Troutbeck Giant, who was supposed to be the son of a monk from Furness Abbey. Hugh was noticed for his feats of strength and could lift huge weights that would cause even ten men to struggle with. He was employed in the district to move great boulders and uproot trees single-handedly. Hugh had the chance to demonstate his strength to the monarch and became a favourite of the court. His apetite was as big as Hugh himself, and could eat an entire sheep at a sitting, as well as porridge thick enough for a mouse to walk over for breakfast. The King promised him any gift he could reasonably bestow, and along with a simple dwelling he asked for a stand of timber for fuel which became known, and still is today, as Hird Wood. Hall Hill, the final resting place for the Giant of Troutbeck can be seen on the right in the forground, with Hird Wood, a National Trust woodland in the background. 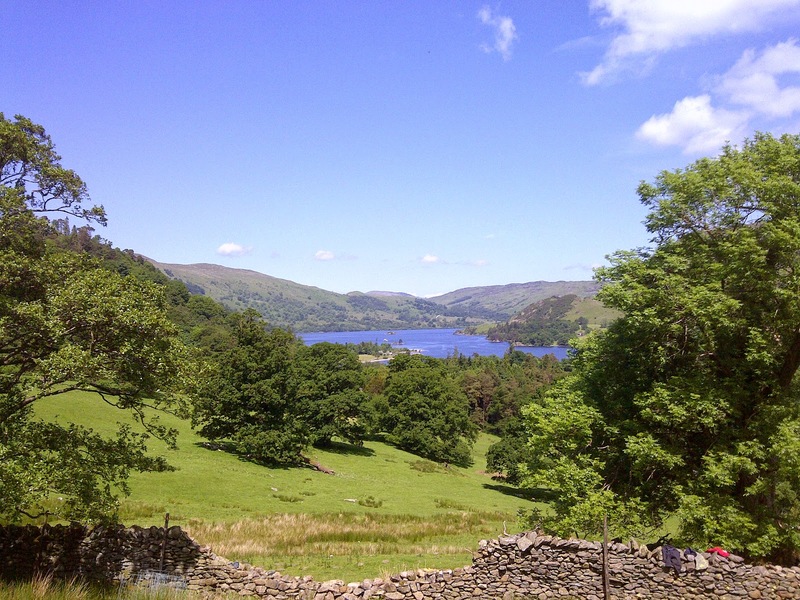 Troutbeck Park Farm, one of Beatrix Potters favourite farms can be seen peeping through the trees in the centre. Could this have been Hughs humble 'tenement'? (Forgive the out-of-season photo!) The valley of Troutbeck beyond is the best wood-pasture in the Lake District, maybe even the best in England. This valley will see some exciting changes over the next 2 years to restore more of this amazing habitat....watch this space! Source: Ghosts and Legends of the Lake District, J. A. Brooks 1988 Jarrold Publishing.